Bart Ehrman has (again) released a book attacking the reliability and historical integrity of the New Testament. Prior installments in this series include Forged in 2011 [review], Jesus, Interrupted in 2009 [review], God’s Problem in 2007, and Misquoting Jesus in 2005. 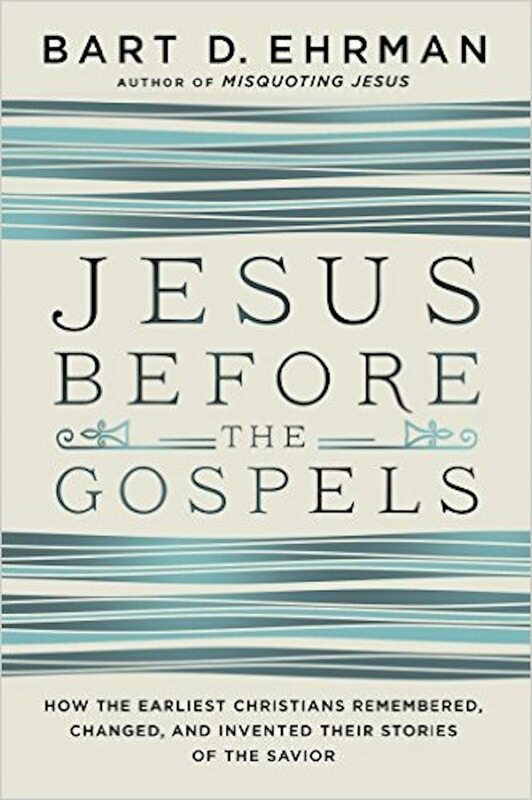 Each of these books, though different in specific topic, tells the same overall story: Ehrman, once an evangelical who attended Moody Bible Institute and Wheaton College, has now discovered, along with the consensus of modern scholarship, that the New Testament—and the Gospels in particular—don’t provide a trustworthy account of the historical Jesus. Instead, what we have are books that are forgeries, contain contradictions, have morally questionable teachings, and have been edited and changed through the centuries. In this latest volume, Jesus Before the Gospels: How the Earliest Christians Remembered, Changed, and Invented Their Stories of the Savior, Ehrman addresses a new area of scholarly concern: the gap of time between the events of Jesus’s life and the earliest written Gospels that purport to record those events. To address this question Ehrman delves into some new areas, including cognitive psychology, memory theory, cultural anthropology, and sociology. But the main rationale for his new volume is recent scholarly work on the transmission of oral tradition in the church’s earliest centuries. Particularly in mind is Richard Bauckham’s Jesus and the Eyewitnesses, but also studies by James D. G. Dunn and Kenneth Bailey. Generally, these studies have suggested that the oral transmission of the Jesus tradition during this time would have been “controlled” in some fashion by either the Christian community (Bailey and Dunn) or the eyewitnesses themselves (Bauckham). Ehrman mounts a case that these views are mistaken; there were no constraints on oral transmission in the ancient world that could guarantee the story hasn’t been changed. We know stories were changed since we have numerous examples of “distorted memories” of Jesus (e.g., Acts of Peter, Gospel of Nicodemus, Protevangelium of James, Infancy Gospel of Thomas, and the Gospel of Thomas). Practically, there would have been no way of preventing people from telling stories of Jesus and changing stories of Jesus. All sorts of people would have told (and changed) stories, not just eyewitnesses. The canonical Gospels weren’t eyewitness accounts of Jesus, but were written 40 to 65 years after the life of Jesus by Gentile Greek-speakers who never knew Jesus (nor any eyewitnesses). Even if the canonical Gospels were written by eyewitnesses, scholarly studies have shown even eyewitness memories can be mistaken. Ehrman appeals to memories of plane crashes, alien abductions, and the story of a Jewish teacher named Israel ben Eliezer (1698–1760). The canonical Gospels themselves contain many “distorted memories” of Jesus in accounts of his life and death. This should be expected in an “oral culture” like early Christianity where most couldn’t read or write. While there is not space to address all these claims in a brief book review, several observations can be made. Then, speaking as if he’s an early convert to Christianity, Ehrman asks, “Do I refuse to tell anyone about Jesus because I am not an eyewitness? Of course not” (84). The problem with these statements is they don’t accurately represent what Bauckham and other scholars claim. No one has suggested non-eyewitnesses never shared stories of Jesus. No one could have prevented them from doing so nor, in many cases, would have wanted to. Instead, the issue is whether the early Christians had a source to which they could turn to find reliable and authoritative versions of what Jesus said and did. And Bauckham (and others) have argued that the eyewitnesses, and the disciples and companions of the eyewitnesses, would have functioned as just such a source. Obviously, this account means there would’ve also been “distorted memories” of Jesus circulating in the early church at the same time as the accurate memories. No one is denying this point. Indeed, this is precisely why we have books like the Acts of Peter and the Gospel of Nicodemus. No doubt some of these distorted memories were eventually written down. Ehrman parades these books before the reader as if they prove his view when in fact they do nothing of the sort. They too fit quite well with the view Bauckham and others have affirmed. Second, Ehrman’s hyper-skepticism (again) goes well beyond what the evidence warrants. He appeals to numerous studies showing eyewitness testimony can sometimes be mistaken—even seriously mistaken. Our memories can sometimes fail us. And of course that’s correct. But this is hardly new information. Even without the help of modern scholars, it’s clear our memories are fallible. To use this fact as a reason to dismiss the eyewitness testimony of the Gospels goes far beyond what the evidence can bear. Sure, the Gospel authors might be mistaken, but the mere possibility isn’t enough. One gets the impression Ehrman himself recognizes he might have pushed his case too far when he clarifies, “I am decidedly not saying that all of our memories are faulty or wrong. Most of the time we remember pretty well” (143, emphasis his). Ehrman would no doubt argue he has gone beyond mere possibility in chapters four and five where he claims to prove the Gospels contain contradictions and therefore contain distorted memories. But there are problems here too. There’s serious dispute among scholars about whether these are, in fact, genuine contradictions (for more on that issue, see my review of Erhman’s Jesus, Interrupted). In addition, Ehrman’s methodology for distinguishing between distorted and non-distorted memories is subject to serious scrutiny. It’s certainly not as easy observing “inherent plausibility” in a passage, or whether that passage would be “highly relevant” for the present needs of the Gospel audience, as Ehrman suggests (157). Even if scholars agreed on these criteria (which are themselves debatable), their application is fraught with pitfalls and subjectivity. Yet Ehrman makes it sound as simple as 1–2–3. It’s also worth observing there are two key factors within early Christianity that would have made memories more reliable, though Ehrman gives short attention to both. First, early Christians could have used “notebooks” to record the words and deeds of Jesus at an early point—indeed, the use of such notebooks is often the basis for popular scholarly belief in documents like “Q.” Scholars such as Graham Stanton have written extensively on this sort of topic (Jesus and Gospel, 165–191), but Ehrman seems uninterested. Second, Birger Gerhardsson’s work on memory in ancient Judaism suggests a more reliable process than Ehrman’s reconstruction. Ehrman rejects Gerhardsson’s work under the claim that modern scholars have “noted several major problems” with it (68). Ehrman is correct that Gerhardsson was critiqued extensively, yet he fails to note that his biggest critic, renowned rabbinic scholar Jacob Neusner, actually changed his views on Gerhardsson’s work. In fact, Neusner had such a change of heart he wrote a complimentary foreword to the reprinting of Gerhardsson’s famous book Memory and Manuscript, noting that this was his “act of penance” for his earlier “dismissive” review of Gerhardsson (xxv). This might have been a detail worth mentioning. Third, Ehrman substantially underplays the positive case for the traditional authorship of the Gospels. Time and again he repeats his claim that the Gospels were written 40 to 65 years after the fact by Greek-speaking Gentiles who never saw or interviewed an eyewitness. But this claim is not nearly so certain as Ehrman suggests. For one, there are serious challenges to dating all four Gospels post-AD 70. A strong case can be made (which we cannot repeat here) that Mark’s Gospel was written in the 50s, which would greatly shrink this so-called gap of time between the life of Jesus and the production of the Gospels. Moreover, Ehrman does a remarkable job of dismissing virtually every line of evidence that points to an early acceptance of four Gospels attributed to Matthew, Mark, Luke, and John. He insists John 21:24 doesn’t constitute a claim that John himself wrote the Gospel of John, despite the serious scholarship on the other side of the question (and he interacts with none of it). He admits the apostolic fathers quoted Matthew and Luke, but he dismisses this fact since they didn’t explicitly name the book they were quoting (a practice that occurs even when New Testament writers cite the Old Testament!). He insists Papias’s testimony to Mark and Matthew should be dismissed since he “does not know any eyewitnesses” (112), despite serious scholarly work that suggests Papias knew the apostle John. And in order to avoid the implications of the uniformity of the Gospel titles in the second century, Ehrman offers the surprising, and to some extent novel, proposal that “some kind of authoritative and influential edition of the four Gospels was published and circulated in Rome” (124). Needless to say, one gets the impression Ehrman is laboring hard to avoid a substantial amount of evidence that suggests the names Matthew, Mark, Luke, and John were attached to these books from an early time. Fourth, and perhaps most fundamentally, Ehrman mistakenly assumes early Christianity was an “oral culture.” He repeats this claim throughout the book and uses it as a basis for his main thesis: “Traditions in oral cultures do not remain the same over time, but change rapidly, repeatedly, and extensively” (183). The problem, of course, is Ehrman simply declares Christianity was an oral culture without ever demonstrating it. If Beard is correct, then the premise of Ehrman’s entire argument is fundamentally flawed. Christianity wasn’t an oral culture, but one highly dependent on the written word, primarily the Old Testament in the earliest stages and eventually the New Testament writings. In sum, Ehrman has written another interesting, provocative, and, at times, even insightful book. But just like his prior books, he’s continually tripped up by a hyper-skeptical methodology that seems bent on poking holes in the authenticity of the Gospels. He takes possibilities and turns them into probabilities and eventually into established fact. Ironically, that’s the methodology he often accuses fundamentalist Christians of employing.